Web site forwarding allows you to redirect multiple HTTP requests from your domain name to another Web address. Internet users, entering your domain name in the browser address bar, will be redirected to the web site you insert in Web-forwarding settings. For the work of Web-forwarding service, domains are provided with DNS-servers and their setting tools for free. 1. Url forwarding 301. This mode ensures that your visitors will see in address bar the destination URL and not the source URL, as it doesn't use frames. 2. Url masking. This mode ensures that your visitors will see in the adress bar the source URL and not the destination URL. With masking activated, visitors aren’t aware that they are being sent to a different website, regardless of where they are within your website, as URL Masking will serve a 'Frames' page to your browser. Though, it is important to note that the destination URL still can be figured out by any visitor. 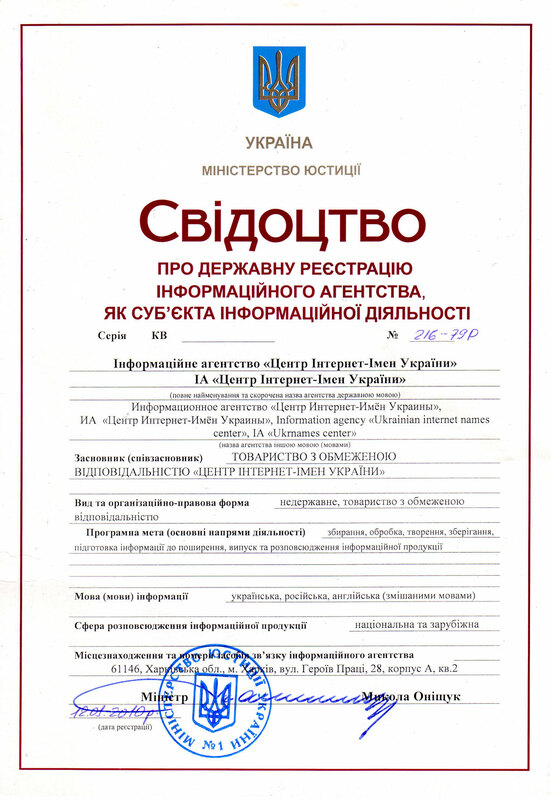 This service is available for domain names with Ukrnames registrar (www.ukrnames.com). If you have a domain from other registrar, you can transfer it to Center of Ukrainian Internet Names (http://ukrnames.com/domains/transfer_domains.jsp) and activate Email forwarding service. Than you can set it up or enable/disable during the entire period of domain name registration.